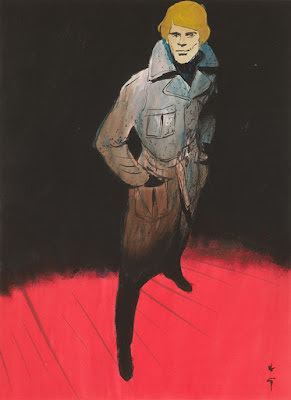 Having just recently posted an extra large post on all of Rene Gruau's mens illustrations here, I'm absolutely delighted to see that The Fashion Illustration Gallery in association with Paul Smith will be launching a new exhibition on the 21st March, The Gruau Man. I will most DEFINITELY be attending, any chance to see Gruau's work up close is always one that shouldn't be missed. The exhibition will focus largely on his work with Sir Magazine, which you can see more of the covers for here. Fashion Illustration Gallery in association with Paul Smith No.9 Albemarle Street is delighted to present The Gruau Man an exhibition of works on paper made by Ren� Gruau featuring only men. International Textiles magazine whose Gruau covers FIG exhibited at The Mayor Gallery at the end of 2010. On the surface, crafted in gouache and felt tip pen, Gruau�s man is chiselled, groomed, suave and sophisticated. Suited and booted he is always dapper, sometimes depicted with a strategically dipped Trilby hat and occasionally accessorized with an umbrella or cigarette. He�s the picture of simmering machismo. He�s the man about town, a real life James Bond in control of every situation he finds himself in. Beneath the surface and the primary colours Gruau�s man, for all his brooding self assuredness makes Lichtenstein�s Brad look positively three dimensional. When he appears with a suitcase you can�t be sure that he�s really going anywhere and the longer he strikes a pose and stares out of his frame the more one realises his eyes are connecting only with his own. He�s looking in the mirror and we repeatedly catch him doing so. Gruau�s man is to Gruau�s woman what Ken is to Barbie or Leandro Penna is to Katie Price. He�s a piece of arm candy an accessory to fashion. He�s Gruau�s fantasy Action Man. another appears in Cally Blackman�s 100 Years of Fashion Illustration.